One of the city's most enduring landmarks provides the backdrop for an unforgettable hotel experience. 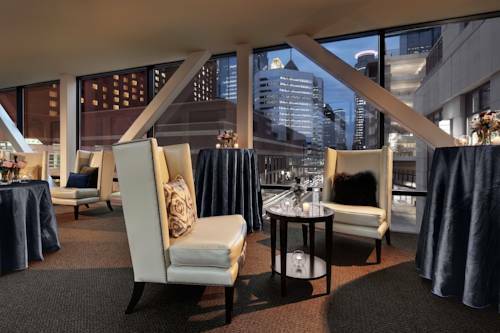 The newly renovated Hotel Ivy, a Luxury Collection Hotel, Minneapolis is connected to the city's Skyway system, allowing for unfettered access to popular downtown attractions. Tradition and modernity coexist harmoniously in our 136 rooms and suites, which feature high-speed Wi-Fi access, original artwork, fine linens and limestone bathrooms. Elsewhere within the hotel, the Ivy Spa Club welcomes you with indulgent treatments, hydrotherapy rooms and plunge pools, as well as a fully equipped fitness center. Sample meticulously prepared Italian cuisine at Monello, or a creative cocktail at Constantine. Those wishing to host an event will be delighted with our luxury hotel's distinctive spaces, which include a boardroom and an opulent Penthouse Suite. For those interested in exploring, our hotel places the Minneapolis Convention Center, Nicollet Mall, Orchestra Hall and the Guthrie Theater within your reach. The Bar at Hotel Ivy: Indulge in sparkling libations and shareable plates, with weekly happy hours and entertainment. Monello: Embrace the flavors of the Mediterranean at this warm and welcoming hotel restaurant, which showcases coastal Italian fare and an extensive wine list. Our house-made limoncello is a particular favorite among restaurant patrons. Constantine: Lush and cozy, this subterranean bar provides an intimate refuge from the energy of downtown Minneapolis. Linger over an artfully crafted cocktail, prepared by charismatic bartenders who still appreciate the art of good conversation.